"cheat-sheet" that beginners and intermediates can reflect on from time to time. They are the basic elements, in which composting worms, like Eisenia Fedita, need for optimal productivity. You'll notice that last one, "privacy". While this is important it's not crucial to remember. I would rather keep the list shorter to make it easier to remember and "privacy" is really not an element as much as it is a piece of mind. While you do have to maintain the worm bin let's look at "privacy" more as "less disturbance". Remember, the literature below is ONLY a guideline. While composting worms can certainly live outside their comfort zone keeping temperatures around 55°F – 65°F (13°C -18°C) will be optimal. I'll talk later on about synergistics but sometimes if you can get 2 or 3 steps right then others seem to fall into place. For instance, if you have the right temperature and darkness, just add the food and the worms will do the rest. The food contains moisture and the worms will naturally aerate the soil. If you keep your bins in a basement, like me, then you'll never have to worry about temperature if you have a cool basement. 2. Moist - damp sponge theory...just right! “You have to squeeze it to get water out.” The “damp sponge” theory has always been the standard. There is always an allowance to deviate for everything in worm composting. It can be slightly wetter and slightly dryer. Generally, the worm bin should always get enough moisture from the food you put in. Always keep a spray bottle next to the bin to help control moisture. It may dry out on top first. When this happens…Sprits It! want it to drip if you barely squeeze it either. Keep burlap, damp sheets of newspaper, or equivalent on top of the material to keep in moisture. If your sheets on top start to dry then spraying often will create a moist environment. The spaying frequency will depend on the type of bin you have or food you're adding. 3. Dark - No Light at All! Just like in nature, composting worms are found under the decaying material during daylight hours. Their skin is extremely sensitive to light and if exposed too long will die. Your worm bin is a synthetic copy of their natural habitat at optimal conditions. Chances are your worm bin is already light proof. If going the D-I-Y route make sure you use opaque and not amorphous colors for your walls. The #1 cause of death to worms by most beginners is OVERFEEDING! This causes excess moisture/water. The worms can’t keep up with the food supply. You'll hear many people say that worms can eat their entire weight in food every day. This is not true when starting out from scratch. 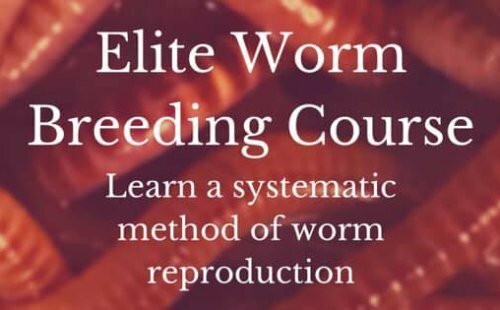 Beginner worm farmers get very excited and many jump in without a good knowledge of feeding rations. They order 1 pound of worms and feed them 1 weeks supply of food. Imagine! That's 7 lbs. of food sitting in the worm bin and some worms just won't eat until they get adapted to their new environment. I'm embarrassed! This was me when I first started. This causes the food to turn acidic, smell, create excess moisture and block the oxygen from penetrating. All of this invites unwanted pests into your worm bin. Feed the worms 2 generous handfuls of food per 1 pd of worms in one area of the worm bin. Keep it under the material by at least 2 inches. When you see the food almost gone then feed some more. You will get a hang of how much food your worms will need as time progresses. Most manufactured worm bins have good ventilation but if you have a plastic bin or some other D-I-Y system be sure to create ventilation holes. As methane gas is released from top it draws in oxygen from underneath the bedding. As worms turn through the bedding they will aerate the material on their own creating ventilation chambers for oxygen to pass through. One difference between nature and a man-made worm bin...Wind! In a man-made system there are walls that separate worms from the outside world thus blocking the passage of forced air through the worm bedding. Along with forced air, plants also give off oxygen into the soil which helps worms and beneficial organisms to breathe. Don't worry though. As long as you have good ventilation the worm's wriggling and the release of gasses will work just fine. can already happen without human intervention. In nature, these 5 factors play off each other in a synergistic sort of way. For example, if it's moist then it can also be cool because when air passes through the bedding the bedding becomes cool due to the evaporation processes. When it is dark then it's out of the sunlight making it cooler and when food is added it introduces moisture which starts the synergistics all over again. Of course all this should take place in the privacy of their (the worms) own home. Which is actually our 6th factor. When there are no predators around the worms are happy and productive. It's very common to check on worm bins once a day and I hope you do when just starting out, but as you get more experienced you'll learn to know when they need feeding or need more moisture based on your own system. but not crucial in the five step success to worm composting. 6. Privacy - Do not disturb...except for maintenance. This isn’t really a priority to remember. I just want to stress that the less disturbed your worms are then the more productive they will be. The more you lift the lid and hold your cuddly little worms because you love them so much then the more they'll think of you as a predator. They'll be less prolific. So Check on your worms 1-2 times/week or more or less as you see fit. These 5 basic elements are what makes a worm bin tick. Even in nature it applies. You don't have to be spot-on in worm composting. Worms are the most forgiving creatures on the planet and they'll always give you a lot of wiggle room ~~~~;) Ha Ha! 2.Moist -damp sponge theory...just right! Thanks for reading and remember, What's In Your Soil?